Nice to see you have posted in here ..... It's appreciated lots of new members seem to over look this section lol . I've tried to post a piccy but can't get it to upload for some reason do i need to do via photo bucket for this forum to recognise it as trying just from my pc isn't working ??? Not really a new member but haven't posted for a while as I've been on holiday for some time , not by choice but it was forced on me . Dart moor isn't the nicest place to stay and the holiday venue was a little drab ... Grey walls and quite rubbish views from the window . Food was ok 3 times a day but nothing much more is worth mentioning , had a few slips with soap in the showers . Now that was an eye watering experience . Welcome back you bad boy. Thank you everyone for the very warm welcome back , can't say I've been made to feel this welcome in a long time . Hi. 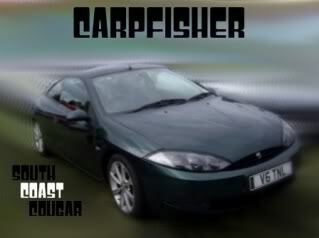 My name is Paul, I am new to this site, have been a member on uk cougar site for about 3 months, got a frosty C2 V6 manual, just put 17 inch alloys on, rear strut brace, up rated rear hatch struts, short shift gear stick, lots more planned for the future. Tried to put pictures up of my car, but "computer says no".... lol... have to wait 7 days for that.